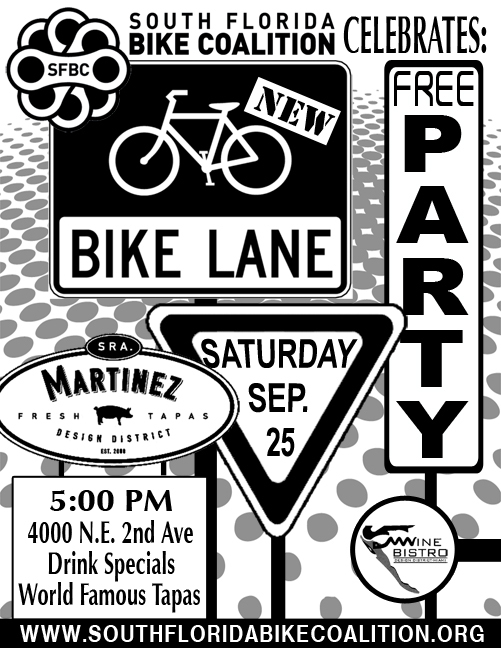 On Saturday I photographed the opening of the new bike line in the Design District of Miami. The event was organized and hosted by the South Florida Bike Coalition and Executive Director Kathryn Moore explained the event was meant as a “Thank You” to Mayor Tomas P. Regalado’s office for providing more bike lanes in the city. Sra. Martinez Restaurant generously sponsored the event and was overseen by manager Jorge Anaya-Lopez. The over 50 attendees got to ride the debut of the new Deco Bike–the Miami Beach public bicycle sharing and rental program. Attending the event were EMERGE Miami members Bruce Wayne Stanley, Adam Schachner and Leah Weston; the City of Miami Bicycle Coordinator Collin Worth; David Henderson, President of the Florida Bicycle Association; South Florida Bike Coalition board members Larry Silverman and Felipe Azenha who also writes for Transit Miami; Alison Austin, candidate for City of MIami District 5; City of Miami Police bike patrol officer Anderson dropped by; Kaelsie Saravia and Tom Blazejack of the Green Mobility Network; the 1 Sky Climate Change Florida organizer Andrea Cuccaro; Miami’s longest working bicycle messenger Robert Noval; the poster promoting the event was designed by Connie Johnson; the three co-directors of YouthBike.Org Richard Page, Claudia Montesinos and Roger Horne; Rydel Deed with the Miami Bike Scene; Miami Blogger and Cyclist Gustavo Llamas and Carla Llamas and many bike enthusiasts including: Nobert Morel, Jeremy Schnall, Luis Rubio, Verena Streber, Jessica Goldfin, Olga Ramos, Dania Otero, Dieter Baue, Dario Gonzalez and Olga Cano brought her 18-month old nephew. There was even entertainment provided by Mark “Speedbump” Lowe performing his bicycle Superman stunts. If I left out any names or organizers, please email them to me for inclusion. All images on my website are available for purchase as prints, enlargements or high-resolution downloads, please email me about my online ordering system. If you would like a photo of you “tagged” so you can post it as your Facebook profile picture, simply send a friend request to me, Liam Crotty, and I’ll friend and “tag” you. People hire me to photograph their events and do portraiture and to stay updated on my latest photography, Fan, Like or Follow me on Facebook Liam Crotty Photography or Twitter LiamCrottyPhoto. the “speed bump” guy performing.